1. Adams, Arthur E., Bolsheviks in the Ukraine: The Second Campaign, 1918-1919. New Haven, Yale University Press 1963. 4. A. Archipenko: Fifty Creative Years, 1908-1958 New York, Tekhue, 1960. (By Alexander Archipenko and fifty historians). 5. Armstrong J. A., Ukrainian Nationalism, 1939-19A5* New York, Columbia University Press, 1955. 8. Borys Jurij, The Russian Communist Party & Sovietization of Ukraine, 1960, Stockholm. 9. 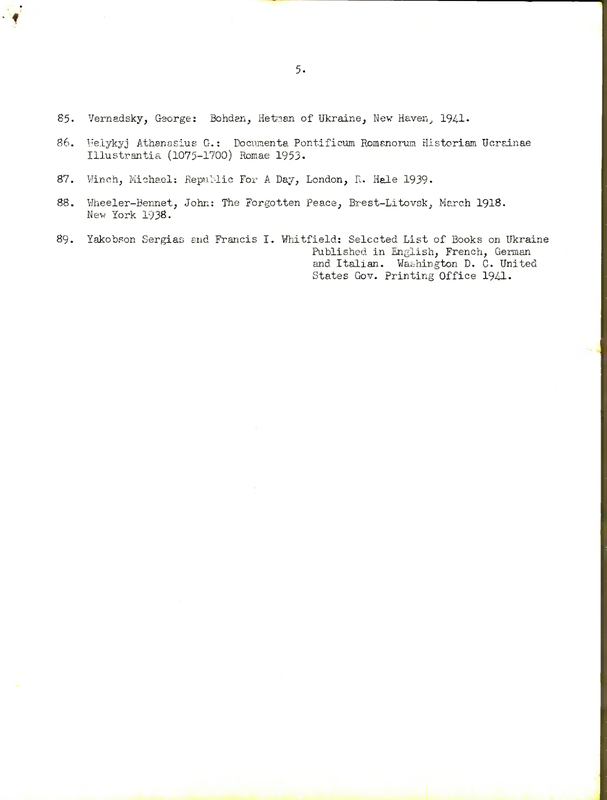 Bojko, Jurij,: Taras Shevchenko and West European Literature, London, Assoc, of Ukrainians in Great Britain, 1956. 10. Bray William G., Russian Frontiers, From Muscovy to Krushchev, 1963, Chapter "Ukraine". 11. 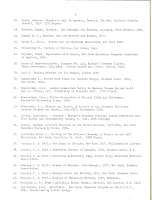 Budurowycz, Bohdan,: Polish-Soviet Relations 1932-1939 New York, Columbia University Press, 1963. 13. Chamberlin, W.H., The Russian Revolution 1917-1921, New York, 1935 MacMillan. 14. Chirovsky N., Old Ukraine, New Jersey, 1963- The Florham Park Press. 16. Chyz Yaroslau: The Ukrainian Immigrants in the United States, Scranton, Pa. 1932. 17. Coleman A. P.: Brief, Survey of Ukrainian Literature, New York, 1936. 18. Qnytryshyn B., Moscow and the Ukraine 1918-1953 Bookman Assoc. N.Y. 1956. 19. Doroshenko D., History of Ukraine, Edmonton, 1940. 20. 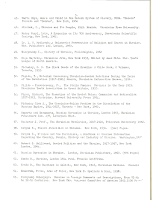 Doroshenko D., A Survey of Ukrainian Historiography, New York 1957, Ukrainian Acadeny of Arts and Sciences in the U. S.
21. Dashnyk Walter, Martyrdom in Ukraine, New York, 1946. 24. Gambal M. S., Ukraine, Rus and Moscovy and Russia, 1937. 25. Horak S., Ph.D., Poland and her National Minorities, New York 1961. 26. Hrushevsky M., History of Ukraine, New Haven, 1941. 27. Hryshko, Vasyl, Experience with Russia, New York Ukrainian Congress Committee of America, 1956. 28. House of Representatives, Document No. 445, Europe's Freedom Fighter, Taras Shevchenko, 1914-1861. United States Gov. Print. Office, I960. 29. Hugh P. Vowles, Ukraine and Its People, London 1939. 30. Kamenetsky I., Secret Nazi Plans for Eastern Europe, Bookman Assoc. I961, New Haven, Conn.
31. Kamenetsky, Ihor: German Lebensraum Policy in Eastern Europe During World War 11. Urbana, Iff. University of Illinois 1957. (272 Pages). 32. Kamenetsky, Ihor,: Hitler Occupation of Ukraine (1941-44) Milwaukee, Marquette University Press, 1956. 33. Kononenko, K.,: Ukraine and Russia, A History of the Economic Relations between Ukraine and Russia, 1654-1917, Milwaukee, 1958. 35. Luckyj, George: Literary Politics in the Soviet Ukraine, 1917-1934, New York Columbia University Press, 1956. 37. Manning C.A. 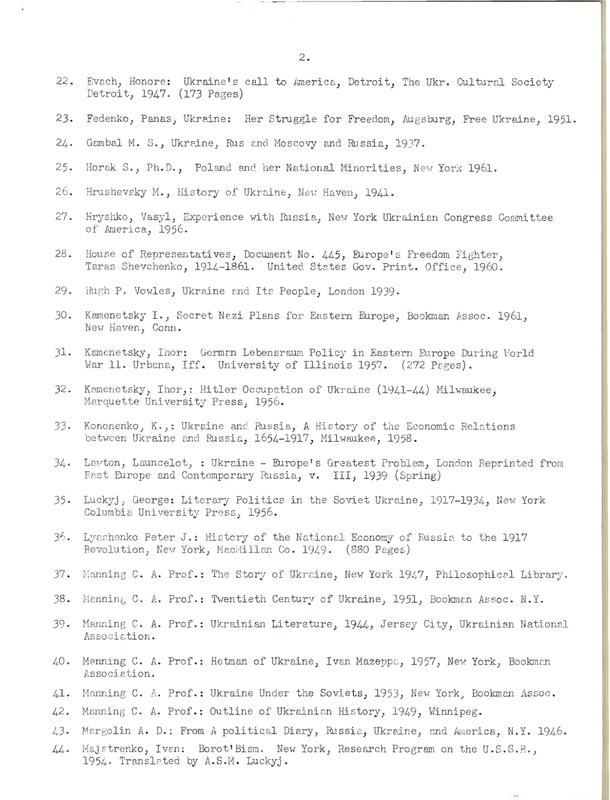 Prof.: The Story of Ukraine, New York 1947, Philosophical Library. 38. Manning C.A. 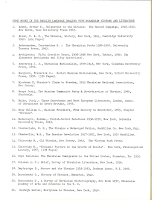 Prof.: Twentieth Century of Ukraine, 1951, Bookmôn Assoc. N.Y.
40. 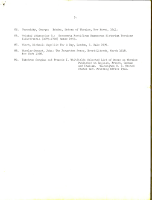 Manning C. A. Prof.: Hetman of Ukraine, Ivan Mazeppa, 1957, New York, Bookman Aissociation. 41. 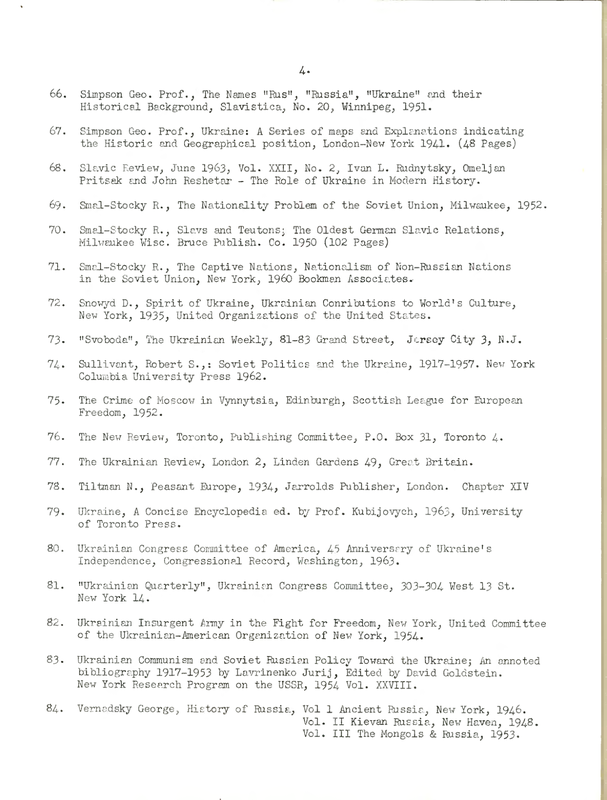 Manning C. A. Prof.: Ukraine Under the Soviets, 1953, New York, Bookman Assoc. 42. Manning C. A. Prof.: Outline of Ukrainian History, 1949, Winnipeg. 43. Margolin A. D.: From A political Diary, Russia, Ukraine, and America, N.Y. 1946. 44. Majstrenko, Ivan: Borot'Bism. New York, Research Program on the U.S.S.R., 1954 Translated by A.S.M. Luckyj. 46. Mirchuk, I., Ukraine and Its People, 1949- Munich. Ukrainian Free University. 47. Mudry Vasyl, Lviv, A Symposium on Its 700 Anniversary, Shevchenko Scientific Society, New York, 1962. 48. Dr. L. vJ. Mydlowsky,: Bolshevist Persecution of Religion and Church in Ukraine. Ukr. Publishers Ltd. London, 1963. 50. Olga Dmytriw,: Ukrainian Arts, New York 1955; Edited by Anne Hits. Ukr. Youth League of North America. 51. Pidhainy, S.O. The Black Deeds of the Kremlin: A White Book, 2 Volumes, Toronto, 1953. 52. Pigido, F., Material Concerning Ukrainian-Jewish Relations During the Years of the Revolution (1917-1921) Munich, Ukrainian Information Bureau, 1956. 53. Pigido - Pravoberezny, F., The Stalin Famine: Ukrainie in the Year 1933- Ukrainian Youth Association in Great Britain, 1953. 54. Pipes, Richard, The Forma.tion of the Soviet Union: Communism and Nationalism 1917-1923, Cambridge, Harvard University Press 1954. 55. Pidhainy Oleh S., The Ukrainirn-Polish Problem in the Dissolution of the Russian Empire, 1914-1917, Toronto - New York, 1962. 56. Reports and Documents, Russian Opression in Ukraine, London 1963, Ukrainian Publishers Ltd. 237, Liverpool Road. 57. 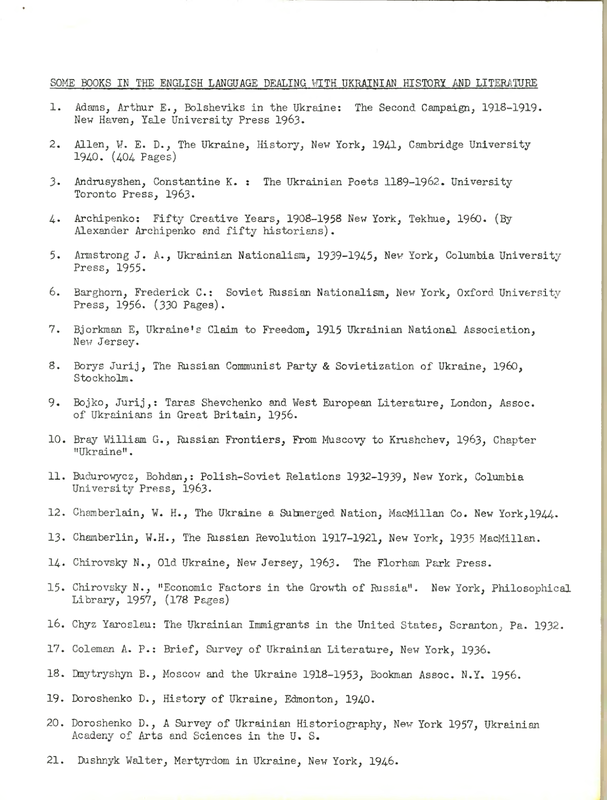 Reshetar J. Prof., The Ukrainian Revolution, 1917-1920, Princeton University 1952. 58. Revyuk E., Polish Atrocities in Ukraine. New York, 1931. (512) Pages. 59. Revyuk E., Ukraine and the Ukrainians, a Handbook of Concise Information Regarding the Country, People, History and Industry of Ukraine. Washington, 1920. 60. 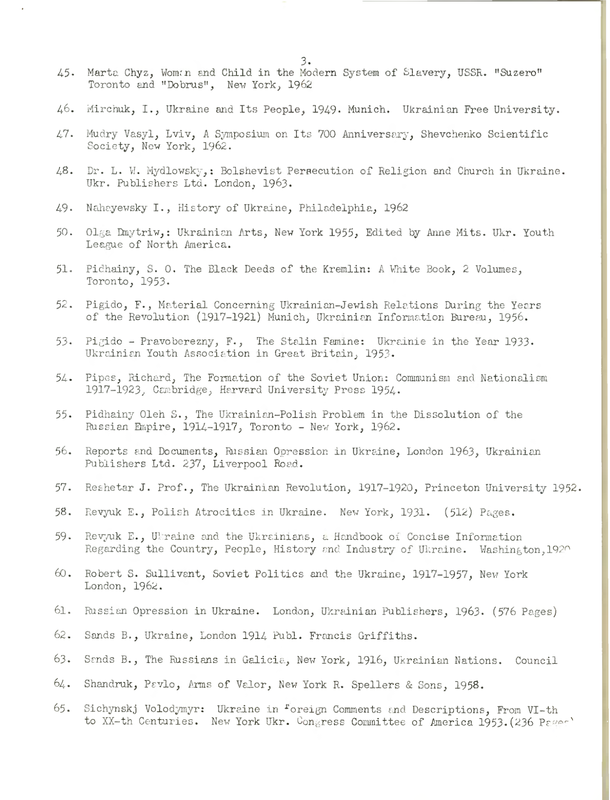 Robert S. Sullivant, Soviet Politics and the Ukraine, 1917-1957, New York London, 1962. 62. Sands B., Ukraine, London 1914 Publ. Francis Griffiths. 64. Shandruk, Psvlo, Arms of Valor, New York R. Spellers & Sons, 1958. 66. Simpson Geo. 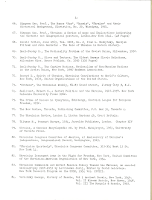 Prof., The Names "Rus", "Russia", "Ukraine" and their Historical Background, Slavistica, No. 20, Winnipeg, 1951. 68. Slavic Review, June 1963, Vol. XXII, No. 2, Ivan L. Rudnytsky, Omeljan Pritssk and John Reshetar - The Role of Ukraine in Modern History. 69. Smal-Stocky R., The Nationality Problem of the Soviet Union, Milwaukee, 1952. 71. Smal-Stocky R., The Captive Nations, Nationalism of Non-Russian Nations in the Soviet Union, New York, I960 Bookman Associates. 72. Snowyd D., Spirit of Ukraine, Ukrainian Contributions to World's Culture, New York, 1935, United Organizations of the United States. 73. "Svoboda", The Ukrainian Weekly, 81-83 Grand Street, Jersey City 3 N.J.
74. Sullivant, Robert S.,: Soviet Politics and the Ukraine, 1917-1957. New York Columbia University Press 1962. 75. The Crime of Moscow in Vynnytsia, Edinburgh, Scottish League for European Freedom, 1952. 76. The New Review, Toronto, Publishing Committee, P.O. Box 31, Toronto 4. 77. The Ukrainian Review, London 2, Linden Gardens 49, Great Britain. 79. Ukraine, A Concise Encyclopedia ed. by Prof. Kubijovych, 1963, University of Toronto Press. 80. Ukrainian Congress Committee of America, 45 Anniversary of Ukraine's Independence, Congressional Record, Washington, 1963. 81. "Ukrainian Quarterly", Ukrainian Congress Committee, 303-304 West 13 St. New York 14. 82. Ukrainian Insurgent Army in the Fight for Freedom, New York, United Committee of the Ukrainian-American Organization of New York, 1954. 83. Ukrainian Communism and Soviet Russian Policy Toward the Ukraine; An annoted bibliography 1917-1953 by Lavrinenko Jurij, Edited by David Goldstein. New York Research Program on the USSR, 1954 Vol. XXVIII. Vol I Ancient Russia, New York, 1946. Vol. II Kievan Russia, New Haven, 1948. Vol. III The Mongols & Russia, 1953. 85. Vernadsky, George: Bohden, Hetfan of Ukraine, New Haven, 1941. 87. Winch, Michael: Repuilic For A Day, London, R. Hale 1939. 88. Wheeler-Bennet, John: The Forgotten Peace, Brest-Litovsk, March 1918. Nev York 1938. 86. Yakobson Sergias and Francis I. Whitfield: Selected List of Books on Ukraine Published in English, French, German and Italian. Washington D. C. United States Gov. Printing Office 1941.